There is always so much to worry about in graduate school: from academic performance, finances, staying healthy and in a nutshell, trying to achieve a balanced lifestyle. For the past year, I decided to go on a path for finding (and keeping) balance. This included getting to know exercise; attending yoga and meditation classes; committing to healthier eating choices; and above all, emotional healing. I ended up enrolling in a 4-week workshop offered by McGill’s Counseling Services (MCS) on cultivating emotional awareness (currently being offered as “Skills for Emotional Regulation” starting November 2nd.) Throughout the workshop, Philip Lemieux, a psychologist at the MCS, emphasized that the most important message to take home from this workshop is “the planting of the mindfulness practice seed”. 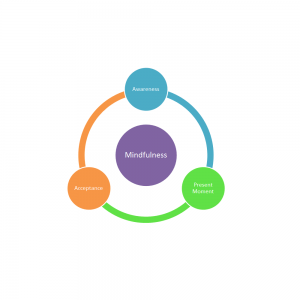 Mindfulness is essentially the act of giving something your full awareness and undivided attention so that your senses are completely engaged by the task at hand. The task may be anything from focusing on your breath, cooking, working in a lab, writing, and even walking. 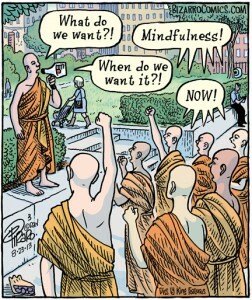 Mindfulness is the act of being in the present moment and re-directing your attention away from the stream of distracting thoughts and back to the current action. Usually, mindfulness is taught and cultivated through meditation by focusing on the movement of breath at the nostril and its flow through the belly and chest. An important aspect of mindfulness is that it is an action devoid of judgment: you cannot judge your thoughts or judge yourself for having thoughts. You will always have active thoughts so the idea is to re-direct and re-focus. Think of it as a flash light. You can shine the light on the chatter in your brain but when you apply mindfulness, you turn off the light on the chatter and instead focus it on the breath. Eventually, your mind will drift because it is simply natural and inevitable, so if you find yourself caught up in thoughts again, don’t panic! The trick is to notice, congratulate yourself for noticing and go back to your breath/task. Continuing to do this builds a positive feedback loop that becomes easier for the brain to access over time, thus changing its default state of action to a more positive approach. Try practicing 5 minutes a day – you can listen to an audio from counseling services here. The second concept introduced during the workshop was that emotions are our bodies’ way of delivering information about our environment. Emotions are thus a vital component of the human experience. Adopting a non-judgmental attitude towards our emotions helps us understand that emotions are sources of information which our body expresses cognitively and physiologically. Consider anxiety, or the flight-or-fight response. It is meant to tell you that your safety is being threatened and accordingly prompt an action. Anger, on the other hand, might indicate that you find yourself in a situation where you are experiencing injustice. Take a moment to observe what emotions you are feeling in a given situation and ask yourself: what is making you feel this way? Did someone say something that contradicts with your values, making you upset? Distancing ourselves from our emotions helps us harness the information presented to us and then allows us to make better-informed decisions on how to respond. Sometimes, emotions may be compounded (i.e. one emotion is called primary and it affects a higher-order secondary emotion). Perhaps you feel angry that someone did not respond to your phone call because you are truly afraid of being friendless and alone. Emotions are complex so it is wise to take a step back for evaluation – being mindful of emotion is key. We can mindfully decide to ride the wave of an emotion and allow ourselves to feel it with all its glory. This is in par with the acceptance and commitment therapy (ACT). ACT allows us to simply accept our emotional state, thereby decreasing its time-course and saving ourselves the trouble of bottling up negative emotions, as well as allowing ourselves to fully experience and relish in positive emotional states. Sometimes, we may feel emotions that are extremely intense and intolerable, such as when grieving for something or someone. We can schedule time to journal our emotions, cry, steam off or engage in other forms of healthy expression (such as vigorous exercise). Afterwards, it is favorable to mindfully engage in a pleasurable activity such as taking a bath or reading a great book to recharge our energy. In case of distress, urgency in taking action is ill-advised. In that case, distractions can be quite useful and help shift our attention to our breath or other things in the room so that we may return to our emotion later on when we feel less prompted to vigorously produce a reaction. Keeping a journal or diary greatly helps in dissecting our emotions and understanding ourselves, which is very helpful given the complex nature of our emotional being. 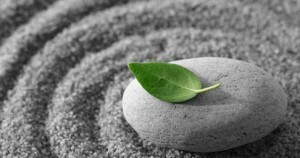 Keeping a record also helps to establish some grounding and to cultivate mindfulness of the emotion. You can also note down where in your body you feel the emotion taking place (e.g in your belly or chest). The MCS offers many workshops and resources for obtaining emotional record forms that you can fill out. Finally, sit down with yourself and take a moment to consider what your values in life might be.What do you seek in life, desire from your career, work relationships…etc? Your list of defined values represents a compass that dictates the direction in which you should be heading, thus influencing your behavior accordingly and making it easier to determine how to respond in situations. If one of your values is to always achieve peace and harmony in the workplace, then it might help you to not get too worked up when your colleague eats your lunch by accident! 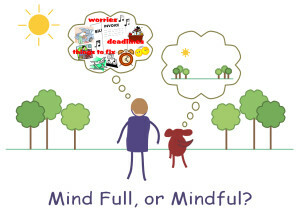 Achieving emotional awareness comes hand in hand with the act of mindfulness. Mindfulness. is a lifestyle within itself and cultivating it requires commitment, acceptance and time. Remember not to judge yourself at all. Change, after all, takes time: it is not a switch but a process, so be very kind and patient with yourself. Next Post Calling all Bloggers, Video Bloggers and Instagrammers! Join the new GradLife team.